Anyway, it's still a growing market and in case you were thinking of setting one up, TemplatePLazza have released a really nice theme that'll do the job for you. 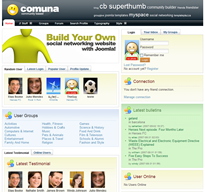 They're also releasing a free module for Community Builder called Superthumb, a highly configurable module to display member details. The theme works completely with Community Builder and Group Jive and looks really nice too. Click here for more information or a demo.